HYDERABAD, TELANGANA, INDIA, July 4, 2018 /EINPresswire.com/ -- Biostimulants act as catalysts to improve the plant quality, quantity, growth and the end yield. There are not some kind of pesticides or nutrients but a kind of organic materials that enhance the overall crop production and disease resistance. They can be supplied to the seed, soil or the plant directly in reasonable traces to stimulate the biological processes in plants like photosynthesis, nucleic acid synthesis, respiration and others. These biostimulants can comprise of one or more substances like the extract from seaweed, microorganisms, plant hormones, enzymes and so on. According to the latest industry report published by Market Data Forecast, the Global Biostimulants Market is estimated to grow at a whopping CAGR of 11.92% to cross USD 3528.02 million by 2023 from the current known net worth of USD 2009.06 million in 2018. 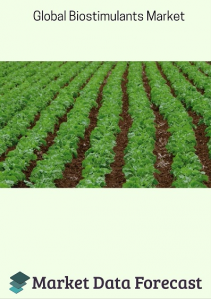 Biostimulants can be extremely helpful in providing nutrients, water storage capacity, the augmented chlorophyll production, stress withholding capabilities, improved metabolism, increased yield of crops, and lot more. Biostimulants can be called with various names like plant growth enhancers, phytostimulants, plant conditioners, bioactivators, and plant strengtheners. They are useful in the entire crop lifespan, starting from the stage of seed growth to final matured crop. The most important factors thriving the using of biostimulants are the increased demand for food supply, the interest of developed nations in agriculture, large-scale requirement of eco-friendly and pollution free plant nutrients. Other important growth drivers for the global biostimulants market can be the support and subsidies from the government, policies for safeguarding soil from degradation, the drastic growth of population, ease of availability of approved products, unexpected climatic changes in the recent times, and many others. However, the huge investment costs for the research and development of products, increasing urbanization, lack of campaigns to educate farmers about the pesticide alternatives, and the dearth of agronomists may act as barriers for the market expansion. The full report provides the complete information about the global biostimulants market and describes the overall market size, share, trends and future analysis. It also provides the in-depth knowledge by explaining the market based on its crop types, applications, active ingredients and geographical regions. Cereals& Oilseeds market contributes the major profits to worldwide biostimulants market followed by fruits & vegetables and Turfs & Ornaments. It is expected to follow the same trend till 2022 with an expectation for the Turf & Ornamental crops to grab a market share of 10.5% by then. The improved farming techniques and the acceptance of biological microorganisms have helped the foliar segment to thrive the market from the top. This segment with a value of USD 1.4 billion in 2016 is expected to grow at a CAGR of 10% till 2022 and thereafter. Furthermore, soil segment is expected to cross USD 300 Million by 2022. Though seaweed extracts segment is the fastest growing portion of the market with 37% of the market share and CAGR of 10.5%, the global biostimulants market is dominated by the acid based ingredients comprising humic, fulvic and amino acids. These three acid-based ingredients constitute almost 50% of the worldwide market share and are estimated to reach USD 2 Billion by 2024. The seaweeds extract market was approximately valued at USD 550 million in 2016. Europe with its demanding population for chemical-free food products holds the lion's share of the market between 36% and 40%. Following Europe, North America and the Asia Pacific are estimated to hold approximately 20% each of the market revenue and then Latin America at 13%. The Asia Pacific is the fastest growing market in the forecast period and estimated to thrive at 12.5% CAGR till 2022. The market analysis, on the whole, depicts a fruitful trend for the global biostimulants market and recent acquisitions like Tradecorp Nutri Performance by Sapec Group and Sri Biotech Laboratories India Limited by Valagro also ensure a promising future for the international biostimulants market expansion. Market Data Forecast is a firm working in market research and business intelligence. With rich experience in research across various business domains, we cater to the needs of both individual and corporate clients. With a well-established in-house team of experts from diverse fields and outsource research network across 100+ countries, we are the sole research providers for most of Fortune 500 companies. Along with the standards of reports being on par excellence, our unique services like free customization, analyst support for the period of six months post to the purchase will be the flag bearers and differentiates us from the rest. Tuberculin Market is expected to reach a market share of 304.73 million in 2023 at a CAGR of 5.5%.